This differentiated Letter C Unit contains a wide variety of alphabet activities that address various learning styles. Songs, games, puppets, visuals, activities, art projects, etc. are all used to teach the letter allowing you to reach the learning needs and interests of every student. These letter activities were created with young children in mind and have plenty of hands-on experiences that get the children involved in the learning process. The letter C writing pages are designed for various motor skill development levels. They range from large "bubble" alphabet letters to writing the letters within 3 lines. There are also worksheets to practice letter recognition and letter sounds. Each practice page is designed to give children practice with writing skills and beginning reading while simultaneously enhancing their fine motor skill development through coloring, tracing, cutting, and pasting.Teachers can use them in all of their classes and parents can use them year to year as their children grow and mature. A puppet mascot is suggested to introduce and teach the letter. The puppet's name begins with the unit's letter helping children remember and learn the letter and its sound. In addition, interactive activities with the puppet, songs, games, and hands-on activities keep the children's interest and make learning fun! Instructions for using the puppet with the app ChatterPIx Kids are also provided. This letter C unit also includes an individual reward/braggin' badge to recognize achievement and mastery of the letter. My students really looked forward to receiving their badges for each letter! 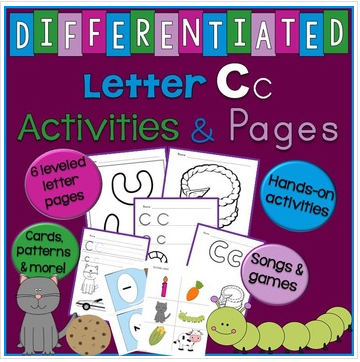 Patterns/reproducibles needed for the letter C activities, the puppet, picture cards, student rewards/badges, and instructions for incorporating apps are included making preparing for class convenient and easy!